What’s that smell in this room? Didn’t you notice it, Brick? Didn’t you notice a powerful and obnoxious odour of mendacity in this room?… There ain’t nothin’ more powerful than the odour of mendacity… You can smell it. It smells like death. Mendacity, for those without instant dictionary access, is a code word for behaviour that is disingenuous, two-faced, deceitful, hypocritical. In other words, a term that more and more Canadians will soon be applying to Mr. Trudeau, whose PR perfume will not be able to cover up the mess he and his team are making in Ottawa much longer. Case in point is a disingenuous crew who call themselves feminists and tout their gay pride credentials while arming misogyny and homophobic violence in Saudi Arabia, where members of the LGBTQ community face execution by a regime bolstered by $15 billion in Trudeau-approved weaponry. Or perhaps there’s the “we love the environment and Indigenous folks” meme, symbolized by sending lots of Canadians to the Paris climate conference while continuing to do their best to support new pipelines and tar sands expansion, and refusing to implement the UN Declaration on the Rights of Indigenous People nor to properly meet the most basic of education funding benchmarks for First Nations youth. The feminist in the PMO has also done little to eliminate the crisis of violence against women in the military. Indeed, it is a Trudeau-appointed War Minister who has refused to release details about the postings of a Canadian soldier and serial sexual assault perpetrator who recently pleaded guilty in Petawawa to six counts of sexual assault. That information would have been vital in tracking down other potential victims of Derrick Gallagher, a veteran of one tour in Afghanistan. Like the presidential American cousin with whom an embarrassing bromance has been going on since the election that booted Harper from office, Trudeau has specialized in useless platitudes that, apart from the odd tinkering with the system, has carried on much of Harper’s devastating legacy. It’s particularly evident in Trudeau’s repeated eagerness to whip out his CF-18s and deploy them in eastern Europe and Pacific war games, all the while committing Canadians to a $30-billion outlay in new warships and warplanes while increasing troop numbers on the ground in Iraq. And as anyone who works with refugees can tell you, after they got their Syrian photo-op, the Liberals have pretty much resorted to the Harper-era level of meanness and pettiness in denying family reunification, continuing to keep refugees and immigrants in jail, refusing to grant ministerial discretion in cases that cry out for such a simple solution, and slowing sponsorships to a trickle. Here at home, Trudeau’s Justice Department has carried on a legal assault on a number of specific communities. For example, over 400 brave women who are current and former RCMP officers filed a class action lawsuit against the systemic misogyny governing the RCMP while Harper was still PM. Trudeau the “feminist” has failed to withdraw Ottawa’s opposition to the lawsuit, leaving women suffering from PTSD to continue to suffer in a manner documented in the excellent No One to Tell, by former RCMP officer Janet Merlo. And while Trudeau proclaims himself the King of Multicultural acceptance, his attack dogs in the state security agencies continue to go after targeted communities while enjoying immunity under the provisions of the repressive C-51, which gives them the power to torture, kidnap and indefinitely detain individuals who, for example, refuse to spy on their community or who condemn CSIS’ abusive practices. Nowhere is Trudeau’s contempt for certain members of Canada’s Muslim community more apparent than in his government’s continued insistence on refusing to follow up on its own resolution calling for a just settlement in the cases of three Canadian citizens — Abdullah Almalki, Ahmad El Maati and Muayyed Nureddin — who were tortured in Syria and Egypt while Liberal Jean Chrétien was in power. Two judicial inquiries found the Liberal government of the day — which includes many of the veteran MPs who are part of Team Trudeau — complicit in this torture, and yet a dozen years after the men came home, they still have received no apology, no compensation, and certainly no hope that changes have been introduced to prevent happening to others what befell them. [A]pologize to Messrs. Almalki, Abou-Elmaati and Nureddin; allow compensation to be paid to Messrs. Almalki, Abou-Elmaati and Nureddin as reparation for the suffering they endured and the difficulties they encountered; and that the Government of Canada do everything necessary to correct misinformation that may exist in records administered by national security agencies in Canada or abroad with respect to Messrs. Almalki, Abou-Elmaati and Nureddin and members of their families. [C]lear ministerial directive against torture and the use of information obtained from torture for all departments and agencies responsible for national security. The ministerial directive must clearly state that the exchange of information with countries is prohibited when there is a credible risk that it could lead, or contribute, to the use of torture. While the Harper government famously issued torture directives allowing its state security agencies to engage in complicity in such nefarious and illegal acts, the Trudeau government has done nothing to discard them, nor to implement the recommendations they supported in 2009. Trudeau’s refusal to repeal C-51 and its very clear complicity in torture provisions means more cases like this will be bound to occur. In addition, while the Liberals in 2009 acknowledged that the men were tortured, their position now remains that the men have to once again prove it as part of their ongoing civil suit. Despite two very lengthy judicial inquiries, the Liberals are refusing to accept their findings. [A]s part of discovery process related to the civil suit, Justice Department lawyers again ‘cross-examined’ at length not only Almalki, but also his wife, two oldest children and his elderly mother. Almalki says an RCMP officer — tied to the now discredited original probe of him — was present throughout several of the interviews. As well, government lawyers wanted to cross-examine his frail 91-year-old father in person, but agreed, reluctantly and at the last moment, to conduct the questioning in writing. ‘My family has been re-traumatized,’ Almalki said. Such brutally heartless decisions have been made by Trudeau’s Justice Minister, Jody Wilson-Raybould. Like his father, Trudeau the younger is enamoured of Canada’s state security agencies and has no qualms about bowing to their every command. Veteran peace campaigners will no doubt recall how the RCMP regularly infiltrated and disrupted peace groups in the early 1980s who were resisting the Trudeau government decision to build and test cruise missiles in Canada. Such dirty tricks were part of what led to the creation of CSIS in the first place, and now Justin Trudeau is carrying on the family tradition. In yet another mendacious act that speaks to Trudeau’s contempt for the human rights of returnees from torture, on June 14, the Trudeau government appealed a Federal Court ruling that found disclosure of certain key documents in the torture cases could proceed even in the unlikely event it would reveal CSIS “sources” from 14 years ago. Claiming national security privilege, Trudeau’s lawyers have insisted that CSIS should enjoy absolute impunity in whatever it does. This issue arose under the Harper government with the case of secret trial detainee Mohamed Harkat of Ottawa (originally imprisoned on secret allegations via the signature of Liberal MP Wayne Easter. Harkat is now fighting a Trudeau government that seeks to deport him to torture in Algeria). When Harkat’s case made it to the Supreme Court, the judges ruled CSIS did not enjoy absolute class privilege, even in closed, secret sessions with only lawyers and a judge present. While the Court found that CSIS sources did not enjoy informer privilege, they declared there is no “unlimited ability to interview and cross-examine human sources.” They fretted that if CSIS sources had to testify, even in secret session, this may have a chilling effect on the agency’s “ability to recruit new sources.” This concern is bizarre, considering ongoing reports from targeted communities indicating that most potential CSIS “sources” would hardly be reliable since they are coerced into spying in exchange for status in Canada. Indeed, one source in the Harkat case appears to have had special inspiration to continue producing “intelligence” because he carried on a torrid affair with the CSIS agent handling him. Not happy with that finding, the Harper government introduced C-44, the Protecting Canadians from Terrorists Act (sic), better known as the Protecting Informers Who Don’t Tell the Truth Act. Based on this legislation, the Trudeau government has been arguing against disclosing key documents to Almalki, El Maati and Nureddin because it is concerned about the potential for identifying informants from 14 years ago. In a preferential option for the powerful, the Trudeau government argued, and the Federal Court of Appeal agreed, that disclosure in these proceedings “could have a direct impact on the life and security of human sources.” What they fail to acknowledge is that denial of the truth about why these men were tortured, and holding spies accountable, also speaks to the most basic human rights that have been violated in the returnees’ cases. The individual whose house was raided was not charged, nor informed of why possession of any document related to Islam could be connected to a crime. Among the items seized by the RCMP were recordings of recitations of the Holy Quran. Seeking answers, the person sought a copy of the Information to Obtain (ITO) in support of the warrant, which had been sealed by the Ontario court. This was denied because the court maintained the individual failed to demonstrate that the order was unlawful. In a December 2015 court hearing, a judge found that the rights of a non-accused person to know why their home was subject to a raid and seizure of materials was not the same as those of an accused person. The judge also found that the burden of proof that the search warrant was obtained unlawfully is on the individual who was subject to the raid. But how can that be proven when the information needed to prove that is sealed and beyond reach? In addition, what inflammatory allegations are in that sealed packet of information to obtain a search warrant that could be harmful to the individual? After all, it appears to have been connected — without any explanation — in some way to the Parliament Hill shootings, and under C-51, a whole range of government agencies can be sharing this information freely not only amongst themselves but with foreign agencies as well. This does not bode well for the individual in question, especially when it comes to overseas travel and the potential for detention and interrogation. In other words, the very issues still being raised by Almalki, El Maati and Nureddin, and still being resisted by the Trudeau government. There was an effort to have this important case heard by the Supreme Court of Canada. But Trudeau’s Justice Dept. had other ideas, and fought the motion to have it heard by the country’s highest court. It was refused. Those still intoxicated by the dream of a world without Harper don’t want the fresh perfume of Trudeaumania to be erased by the cold, hard facts of reality. But so many Canadians’ refusal to acknowledge that Trudeau continues to carry on the Harper era assault on human rights (one that is not unique to Harper, but which was also very much a part of earlier Liberal regimes) simply adds to the collective trauma experienced by so many of the assault’s victims. Yes, Virginia, there is an odour in Ottawa. And that stench is mendacity. Matthew Behrens is a freelance writer and social justice advocate who co-ordinates the Homes not Bombs non-violent direct action network. He has worked closely with the targets of Canadian and U.S. "national security" profiling for many years. Read other articles by Matthew. 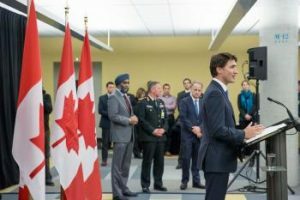 This article was posted on Saturday, August 6th, 2016 at 4:36pm and is filed under Canada, Espionage/"Intelligence", Human Rights, Militarism, Police.